London: A woman has died after apparently being bitten by the UK’s most venomous spider, in what could be the country’s first such death. According to her family, grandmother Pat Gough-Irwin fell ill after being bitten on the finger by a false widow spider. She had to have the end of the finger amputated after weeks of “absolute agony”, her daughter said, but the 60-year-old’s health deteriorated further and she died in hospital on Friday. Last night, hospital managers confirmed they were investigating whether the bite may have triggered her death. If proved, she will have been the first person to have died in Britain as a result of a spider bite. False widows — cousins of the infamous black widow spider — give very painful bites that often swell as the body tries to combat the venom. Some people have reported being left unconscious by the bites, but to date there have never been any confirmed deaths from them. About the size of a 10p piece, with a bulbous body and white markings, the false widow spider is now a fairly common sight in people’s homes, where it seeks refuge in autumn as the weather turns. Some false widows are native to Britain, but the most venomous, the noble false widow, was first imported in fruit crates from the Canary Islands more than a century ago. Since then, they have spread northwards from the South Coast. Gough-Irwin first went to her GP after being bitten in her home in Aldershot, Hampshire, a month ago. It is believed she was told that, although painful, the bite was highly unlikely to cause serious problems. But rather than subsiding, the pain intensified, and she ended up being admitted to hospital. Last Saturday, Gough-Irwin had an operation to have the top of the bitten finger amputated. However, her condition went downhill until she was left “confused and hallucinating”, according to her family. One of Gough-Irwin’s four daughters, Julie Lungley, 43, said she had been left “numb and in total shock” by her mother’s sudden death. Her death comes just weeks after The Mail on Sunday reported that one of the world’s deadliest spiders, a Brazilian Wanderer, was delivered hiding in a bunch of bananas to a South London home by Waitrose. Gough-Irwin’s family fear poor care at Frimley Park Hospital in Camberley, Surrey, might have contributed to her death. In a Facebook posting, Lungley, who runs a Church-based breakfast and after-school club for children in Farnborough, claimed ward staff “knew nothing” about the bite. She alleged they had not read her mother’s GP notes in full, and wrote that she was “unhappy with the lack of care and attention” given. The family will be meeting hospital managers this week to discuss the care Gough-Irwin received and the possibility that the bite may have played a part in her death. 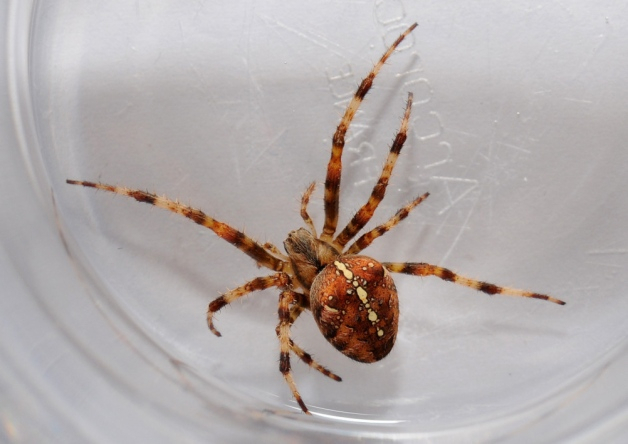 Dr Tim Cockerill, presenter of the BBC’s Spider House, said the noble false widow was the most venomous of false widows but the zoologist said this spider’s bite was not in the same league as the black widow’s. Dr Cockerill said: “Its bite is about as bad as a bee sting. In the UK, several people die of bee stings every year because they have an allergic reaction. But most of the stories in the press show evidence of tissue damage or necrosis and there is nothing in the false widow spider’s venom that can do that. Dr Ron Daniels, a critical care consultant and chief executive of the charity Sepsis UK, said it was “entirely plausible” that Gough-Irwin had developed a secondary infection as a result of the bite.